Kings Fool is the only business card you’ll EVER need, and the only business card guaranteed to make you money! That’s because Kings Fool is both a business card AND a card trick. For as little as $29.95 you will have an unlimited supply of business cards or sell them as a trick and you will have an unlimited supply of income! Point out the King is clearly in the middle of the five cards. Show them the back of the cards and ask them to put a paper clip on the King of Hearts. MOST PEOPLE WON’T GET IT ON THE FIRST TRY! MANY WON’T GET IT ON THE SECOND TRY! The optical illusion is so strong that people will want to show it to their friends. Kings Fool will be shown to more people than any other business card you will ever own. Over 20 minutes of video instructions and information to help you get the most out of your Kings Fool Business Cards. Printed instructions for quick reference. A coupon for FREE setup on your first order of professionally printed Kings Fool Business Cards. A $20.00 VALUE! Kings Fool Business Cards can be custom designed and professionally printed in quantities of 200 or more. Ships 10-14 business days after proofs are approved. Printed with high quality vector graphics. Aqueous gloss coating on both sides. Choose from a large variety of fonts. Images can be added at no extra cost when you provide the image files. 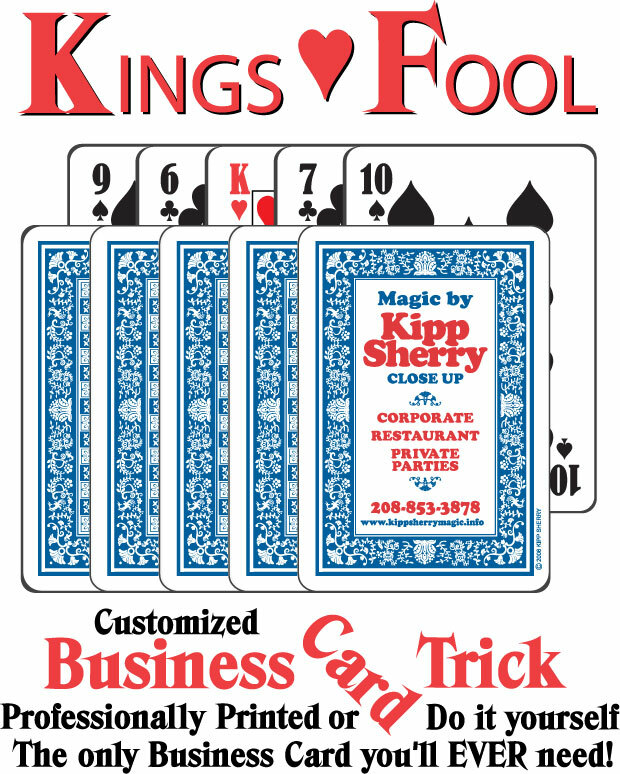 Remember: You can always sell your Kings Fool Business Card as a card trick for $2.00 each and make a profit! For larger quantity quotes or a free sample contact Kipp. Fill out the form below to order your custom printed Kings Fool cards.